Making quilts often leaves me with long scraps of fabric and batting. My middle son (John age 30) asked me to make my oldest son (Gerald age 32) a fishing rod cover for the new pole John made for him. 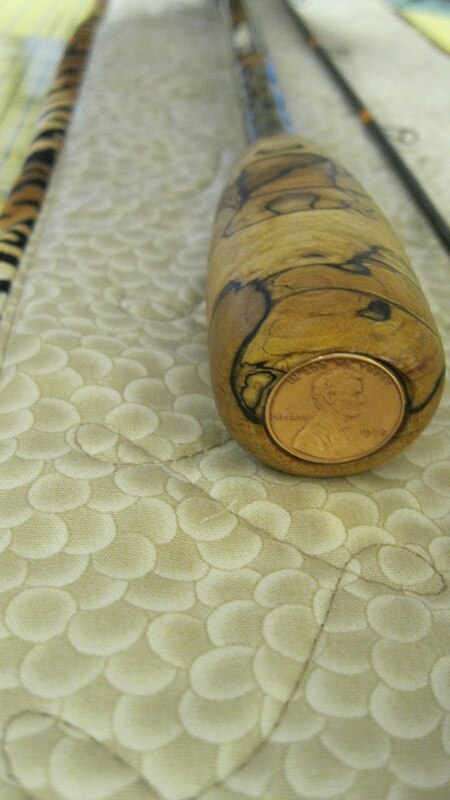 He showed me a purchased cover that was neither long enough or large enough to fit over the eyes of the rod. The purchased rod holder was black and was bound with black fabric. I had some beige fabric that looked a little like fish scales that was left from the back of a quilt. I never throw big scraps like that away. I measured the rod length (it comes in two pieces, so the longer of the two was 58 inches.) and the width. Since I had four pieces the size I needed, I chose to do what any quilter would.....make a quilted holder instead of a plain fabric one. This rod will be shipped to Seattle, WA, which is about 3000 miles cross country, so I figured a little extra padding would be a good thing. I layered the long pieces and long scraps of batting and quilted them. Next, I cut it into two long pieces and layered them so binding could be added. Lastly I added tie straps and fold over top, and a seam down the middle to separate the two pieces of the rod. These photos are of the beautiful rod my son John made. If you have a fisherman/woman in your list of friends, they may want to see these photos. 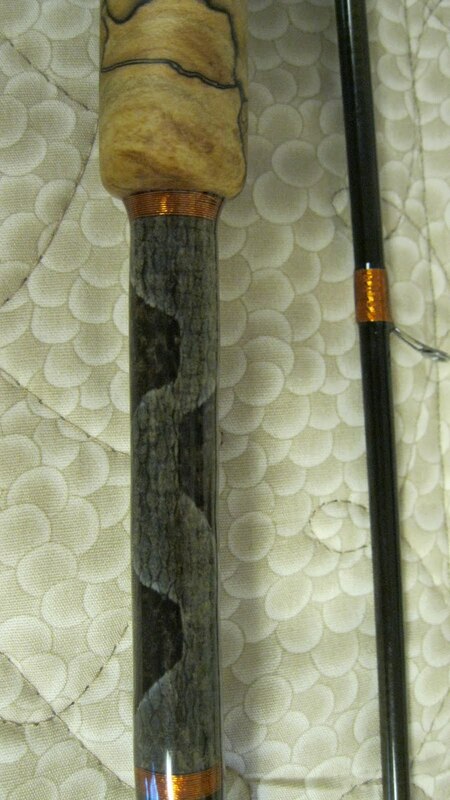 Yes, that is copperhead snake skin on the rod! Gerald was an avid snake lover and caught a copperhead one day before school. He was holding it when I opened the front door and almost had a heart attack! John finished the bottom with a 1978 penny, the year Gerald was born. He has not seen it yet, but I know he will love all the detail and work John put into it. cording to tie it together.